Pulford is a New Zealand author little published in the UK to date. In this tale, Jamie accompanies his newly married mum and step-dad on an unusual honeymoon. 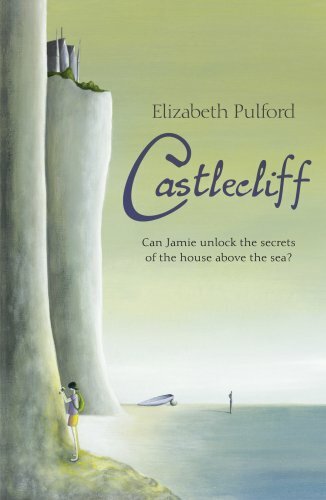 His step-dad’s gran has just died, and left Castlecliff, an old turreted house perched above the sea, which needs to be tidied before it can be sold. The opening chapters suggest a number of possible stories. The imposing house looks as though it holds secrets. It has a tunnel from the kitchen to the beach. It overlooks a bay with an island, a cave and dangerous sea currents. Jamie, whose passion is swimming, isn’t happy because he has fallen out with his best friend. Then there is his developing friendship with Lani, a fragile girl fossil hunter, whose own best friend had been Castlecliff’s dead owner. As it develops, the story manages to pack in all these elements and more, as Lani coaches Jamie’s swimming in the bay; Jamie undertakes a daring, and almost fatal, swim to the cave to find fossils for Lani; and the two friends uncover a tragedy from the past. And a weighty theme, about coping with death and loss, develops alongside Jamie and Lani’s friendship. This is all done deftly and briefly, in Jamie’s own words, in fewer than 150 pages. But, while there is never a dull moment, there is very little space to give the characters and setting substance enough to carry the deeper theme with the emotional conviction it needs.